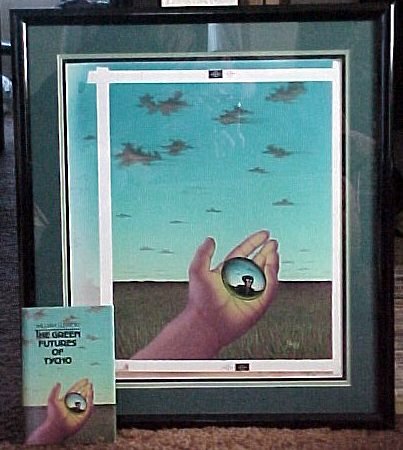 The Green Futures of Tycho is a "wholly remarkable book," to borrow Douglas Adams' description of The Hitchhiker's Guide to the Galaxy. It is the story of a young boy who finds a small time-travel device in his backyard, and the consequences thereof; one of the most interesting is that with continued use of the device, he observes that his future self is changing from slightly disturbed to manipulative to truly evil. Along the way, he indulges in making a few changes to his past -- changes that have thought-provoking consequences. My fascination with time travel and science fiction in general can be traced back to this book. Sleator, William. The green futures of Tycho. with several futures he sees for himself and his family. [1. Science fiction. 2. Space and time--Fiction. a division of NAL Penguin Inc.
For the first edition, the cover was illustrated by James Nazz. 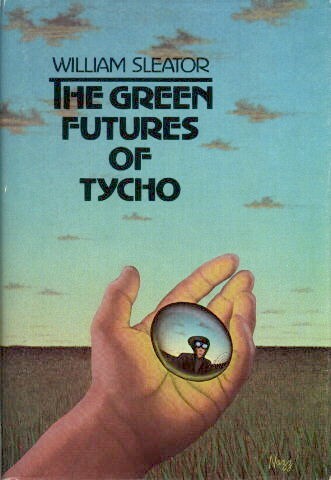 The Green Futures of Tycho has been reprinted with a few different covers, some good, some bad. One in particular that I haven't been able to track down yet was clearly intended to appeal to today's MTV generation. While I cannot condemn this practice out of hand, I can present here the original cover, which is more mysterious and thought-provoking, and therefore (in my mind, at least) more appropriate. The Amazon.com entry for this edition of Green Futures. The home pages of Tycho Sleator, for whom the book was written. It appears that he likes this cover, too. The ISFDB entry for the creator of the cover art, James Nazz, and his own pages. The Fantastic Fiction William Sleator page, which lists Green Futures. Some other William Sleator links. Adam Cadre did a hilarious MST3K-ification of Jim Theis' Eye of Argon that mentions Tycho in a fun way. Tycho Brahe's real first name was "Tyge" - "Tycho" is the Latinized form of the name. The name Tycho means "hitting the mark" in Greek. Travel down an alternate path! Return to the Tycho pages. "Have you ever read a book called The Green Futures of Tycho?"